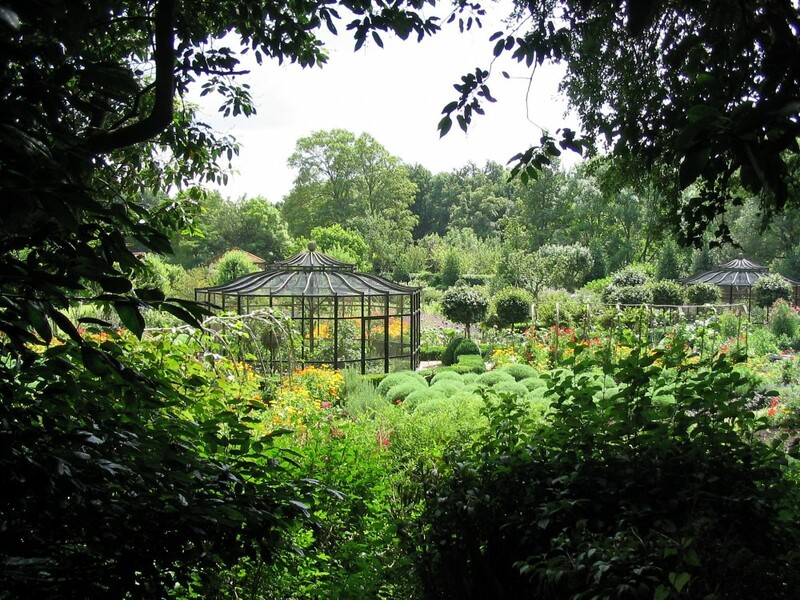 I am a huge fan of garden author and broadcaster Marylynn Abbott, and her garden near Basingstoke is one of my favourites, a great garden upon which she has stamped her flamboyant personality. It is a breath of fresh air, delightful, humorous, and with some of the best Jeykll-inspired planting in Britain and I can forgive her anything, including some of her brave new garden areas that don’t quite come off. Marylynn had a successful career as marketing and tourism manager for the Sydney Opera House, whilst at the same time creating Australia’s most visited garden, Kennerton Green. 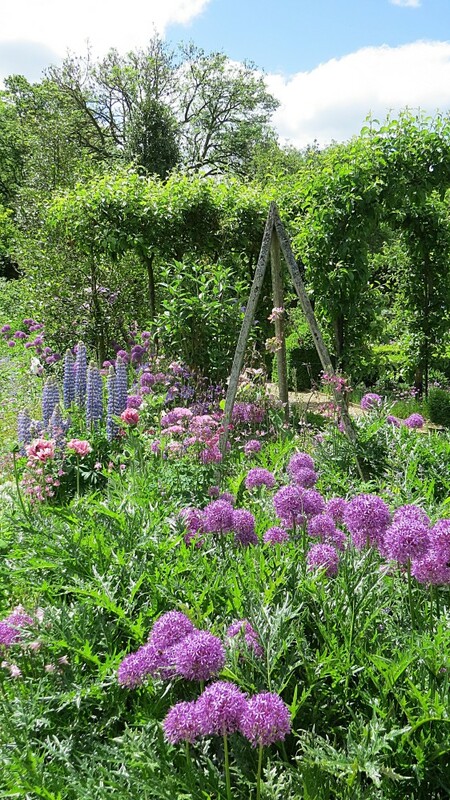 These two passions, gardens and opera, combined with her marketing skills have made West Green House one of the most interesting gardens in the South of England. She is a delightfully down-to-earth person, as happy serving in the gift shop or helping with teas as she is giving garden tours to coach-loads of visiting Americans or being master of ceremonies at the summer opera season that she instigated. West Green House owned by the National Trust came close to being demolished in 1990, following a devastating IRA bomb blast. This was aimed at its former tenant, Lord Alistair McAlpine, a prominent Tory politician and friend and close supporter of Margaret Thatcher. Fortunately common sense prevailed and the external fabric of this substantial pretty red-brick Georgian manor house was rebuilt, leaving interior and garden in poor shape for the incoming tenant to restore. 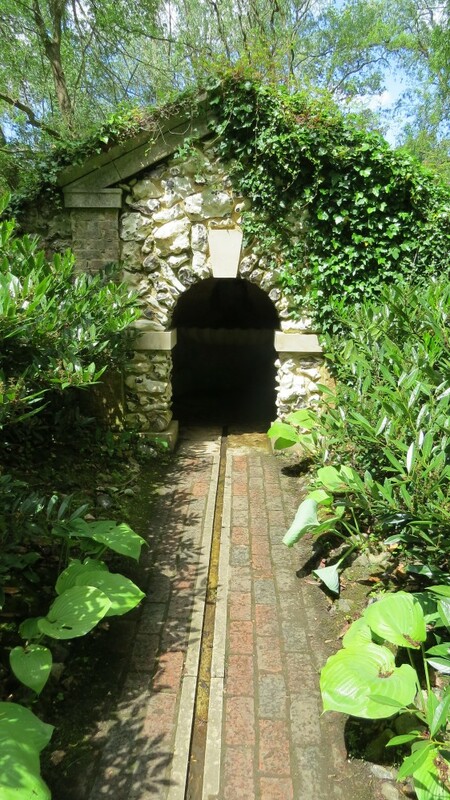 The garden already had an eclectic character when Marylynn took it over, as McAlpine had employed neo-classicist architect Quinlan Terry to create a series of stylish garden follies including a quirky Doric temple, Grotto, Chinese bridge and pagodas. 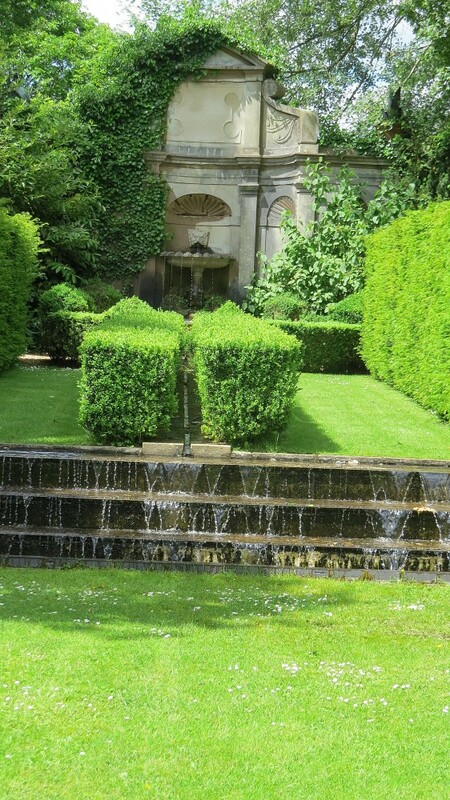 The most significant feature is the Nymphaeum, a water garden with a pair of formal classical ponds, rills and a water staircase. The approach to the garden is through an avenue of old apple trees, past parked picnickers and a row of large cylinders of stored logs, and this sets the relaxed tone for the whole garden. The first garden area is the Courtyard Garden, currently in a state of flux. Formerly this was the surreal small walled Alice Garden set out like a chess board with box teapots, cups and saucers, ladders, red and white roses and cut-out figures of the Mad Hatter, the White Rabbit and the hookah-smoking Caterpillar. Passing through a wisteria draped gate you enter the large Walled Garden. The Walled Garden is the centrepiece of West Green, two-thirds being lawns, box hedges and topiary and superbly planted purple, plum and blue perennial borders. One third is set aside as a decorative potager with regimented lines of vegetables interspersed with rows of flowers, sweet pea wigwams and beds of sculptural clipped santolina gumdrops. Each year there is a different theme and colour scheme for the vegetable garden; one year being Native American planting, the next an Asian vegetable garden, followed by Moroccan fragrant herb planting. It all seems such fun, but with a more serious purpose of introducing visitors to a wide range of different and unusual herbs and vegetables. Stylish ornamental fruit cages complete the picture. The wonderfully generous succession of bulbs starts with drifts, concentric circles and spirals of daffodils in the Lake Field, followed by thousands of tulips, alliums and lilies. Snake’s head fritillaries have naturalised in drifts in the wild meadow areas of the Lake Field. Leading off from one corner of the Walled Garden adjacent to the House are the Theatre Lawn, used for the summer opera performances, and two box parterres, one having England’s most up-market bird coop. 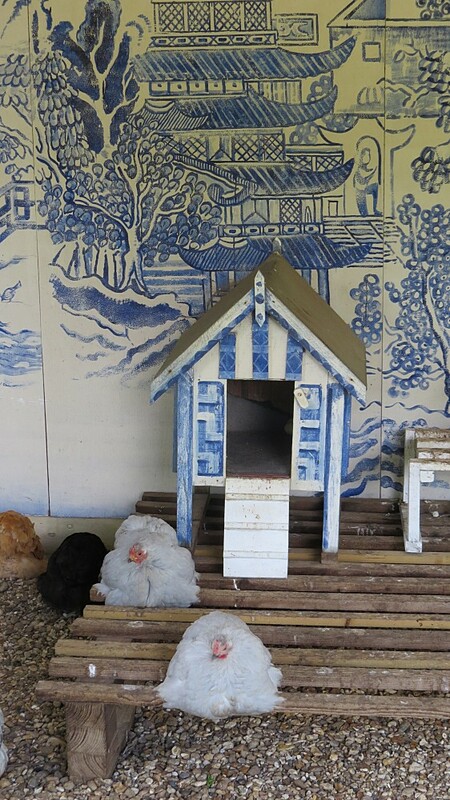 The Chicken Pavilion is another of West Green’s delightfully quirky features, with its willow pattern backdrop and Chinese ornamental chickens proudly strutting around and pecking off blue and white patterned china. Marylynn has added new garden areas to West Green such as the Garden of the Five Bridges and the Edible Hedge which look as it they will work well but two other garden areas are a bit disappointing. 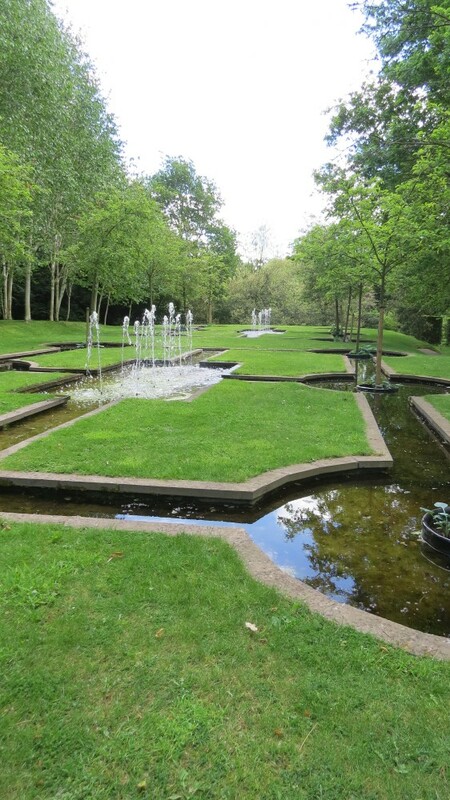 The Paradise Garden, a formal layout of pools fountains and Malus Evereste seems uncomfortably out of scale and the edgings of cut concrete pavers looks cheap and spoil the overall effect. 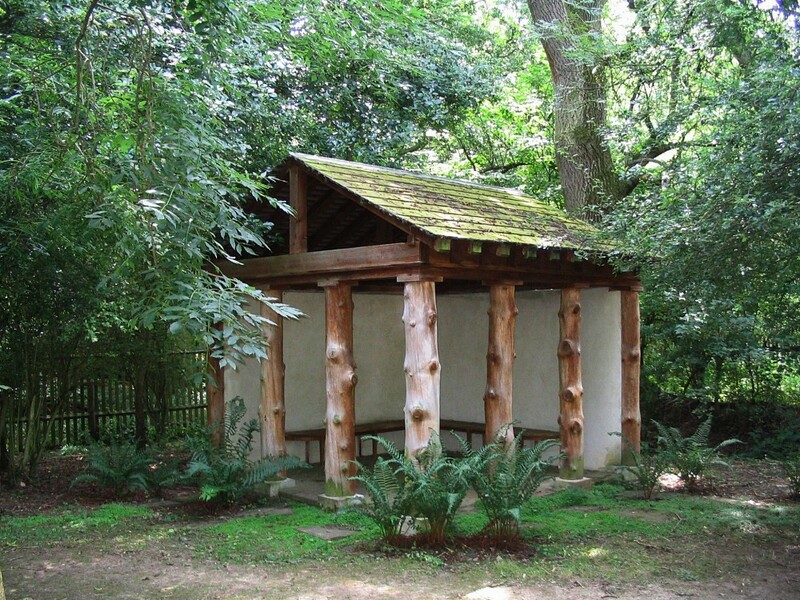 The other underwhelming garden is the Dragon Garden which lies to each side of a clipped hornbeam allee, and next to one of the open sided pagoda-style seating areas. 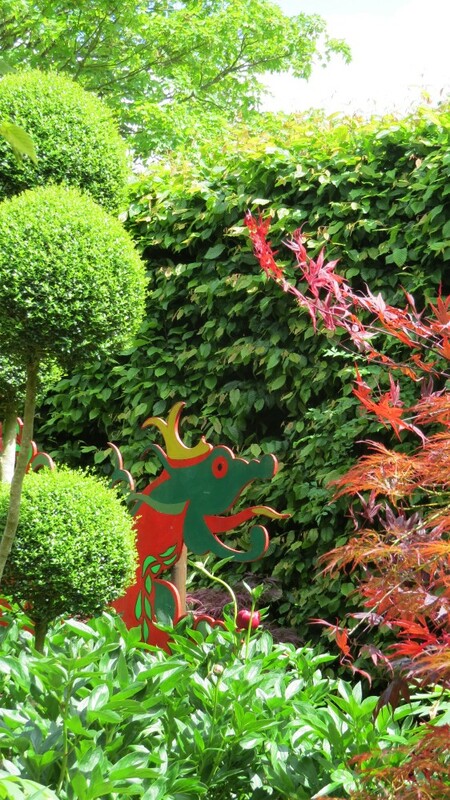 Here the borders of acers and paeonies surrounding the delightful cut-out dragons seem sparse and could do with being substantially beefed up. West Green is a garden to cheer up even the most jaded garden visitor with its light touch its long seasonal interest and superb planting, but is hampered by poor signage, due to its arm’s length relationship with the National Trust. Hopefully West Green’s first garden at the 2014 Chelsea Flower Show, entitled ‘The Topiarist’s Garden’ will raise its profile and introduce it to a wider public. One of my favourite gardens deserves to be better known.